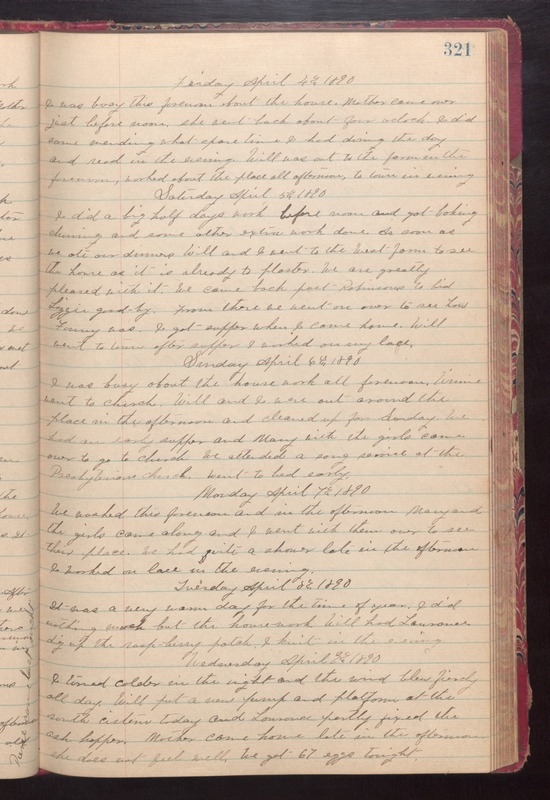 Friday April 4th 1890 I was busy this forenoon about the house. Mother came over just before noon. She went back about four oclock. I did some mending what spare time I had during the day and read in the evening. Will was out to the farm in the forenoon, worked about the place all afternoon, to town in evening. Saturday April 5th 1890 I did a big half days work before noon and got baking churning and some other extra work done. As soon as we ate our dinner Will and I went to the West farm to see the house as it is already to plaster. We are greatly pleased with it. We came back past Robinsons to bid Lizzie good by. From there we went on over to see how Fanny was. I got supper when I came home. Will went to town after supper. I worked on my lace. Sunday April 6th 1890 I was busy about the house work all forenoon. Winnie went to church. Will and I were out around the place in the afternoon and cleaned up for Sunday. We had an early supper and Mary with the girls come over to go to church. We attended a song service at the Presbyterian church. Went to bed early. Monday April 7th 1890 We washed this forenoon and in the afternoon. Mary and the girls came along and I went with them over to see their place. We had quite a shower late in the afternoon. I worked on lace in the evening. Tuesday April 8th 1890 It was a very warm day for the time of year. I did nothing much but the housework. Will had Laurence dig up the raspberry patch. I knit in the evening. Wednesday April 9th 1890 I[t] turned cooler in the night and the wind blew fiercly all day. Will put a new pump and platform at the south cistern today and Laurence partly fixed the ash hopper. Mother came home late in the afternoon. She does not feel well. We got 67 eggs tonight.